My DD2 needed a new Christmas dress this year, having outgrown every single one in the closet, including all the ones made in previous years for DD1. I always knew the day would come when all three of my girls would be all the same size – albeit with their own very different styles and colouring and shape. *sigh* It just seems like I’m not quite ready for them to not be so little anymore. It’s so funny when I think about making new dresses each year for them because they were growing so fast. And then there’s been the lull over the last few years where I just needed to make one to fill in a gap. This year, I’m making three new pretty dresses. This is the first one, and it was done a couple of weeks ago for a party she attended. 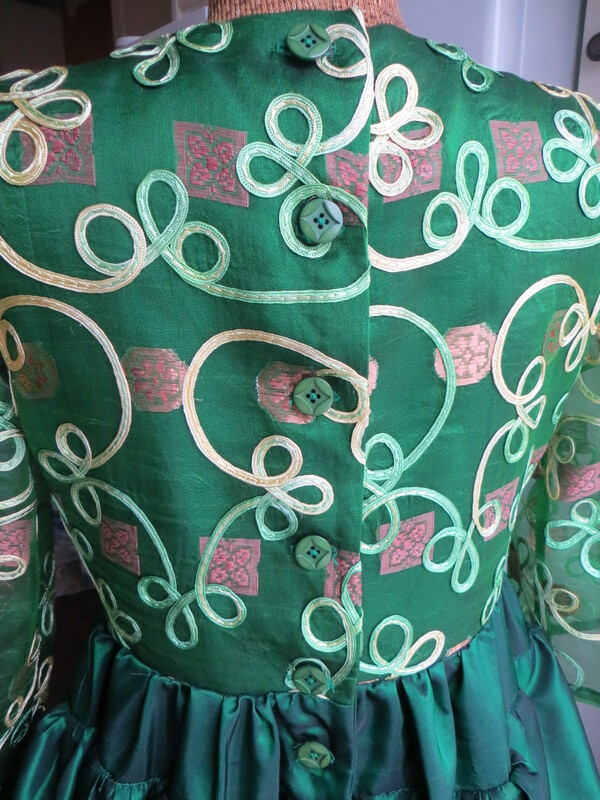 When I asked her what she wanted, she requested a repeat of a previously made green taffeta dress with a lace bodice which she has worn for a coupe of winters. But I couldn’t find the exact same lace when I went looking, so settled for this silk organza for the bodice of the new dress. I used this dress from Burda’s February issue, which will fit into my Burda 2013 Challenge nicely. There were no fitting issues or construction challenges with this garment. I haven’t made up the sash, only because DD2 doesn’t want a sash, and I know she would never wear it even if I did put the time into making it. Besides, she’s a bit beyond a sash-and-bow style. 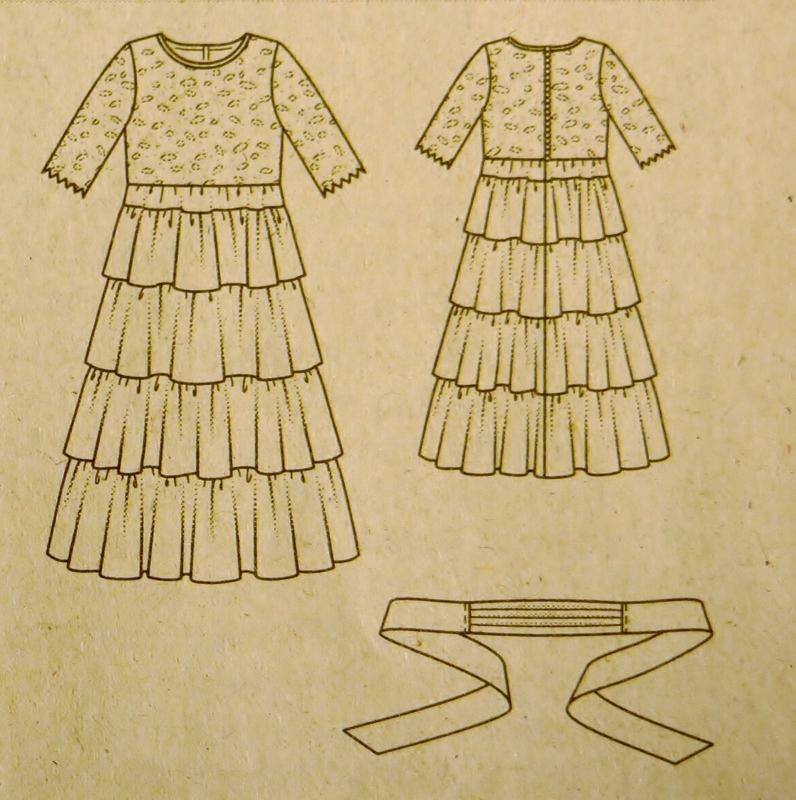 The dress is sized up to a child’s 152, and DD2 is really an adult size 36, so I added the required width, and pleated the neckline to get a close fit. And no, I did not put any thought into pattern placement for the embroidery. I wanted it to sit where it may, and be done with it as it seemed rather random anyways. 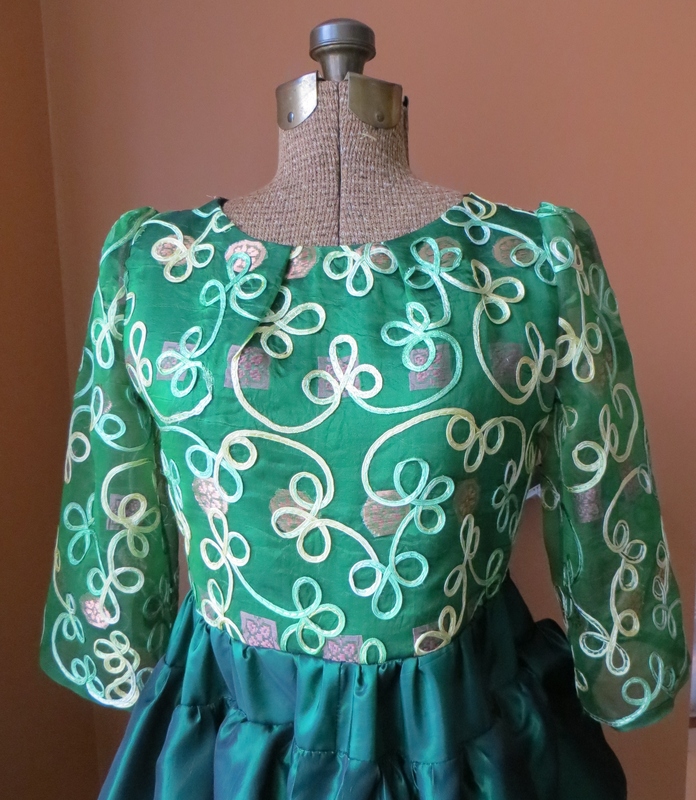 The bodice is underlined with the green taffeta, and the sleeves are only organza. I did not have any green zippers in my stash and didn’t have the time to run out to get one (I was sewing this under a time crunch for that party deadline!!! ), but found these buttons in my stash. It’s been a while since I did a back button closure on dresses for my daughters, and this was a nice touch, I thought. I added a fly for extra coverage. And pink lining! DD2 loves pink and it adds a touch of whimsy. It also picks up on the pink embroidery in the silk: one row of squares is flat silk, the other circles done in metallic threads. I adjusted the suggested length of each ruffle layer to about half, as the taffeta has a lot of body and too much would be too poufy!! 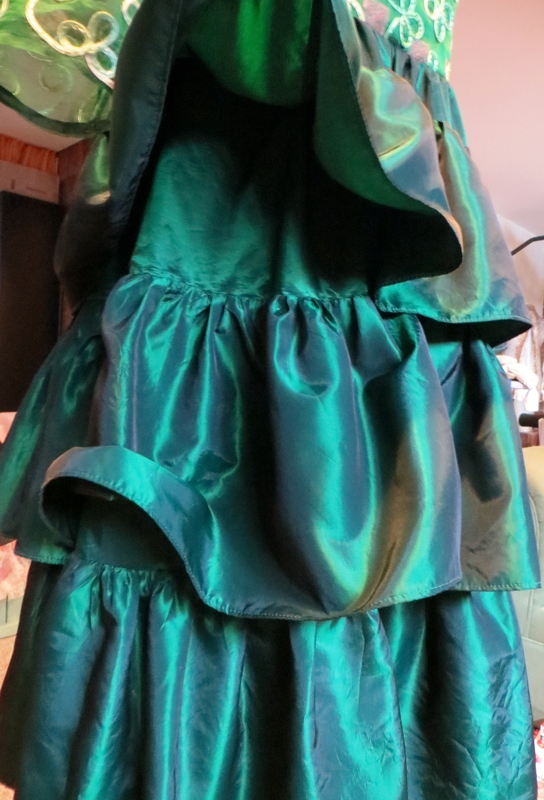 Each layer of ruffles is attached to the skirt proper, which is then gathered and attached to the bodice. 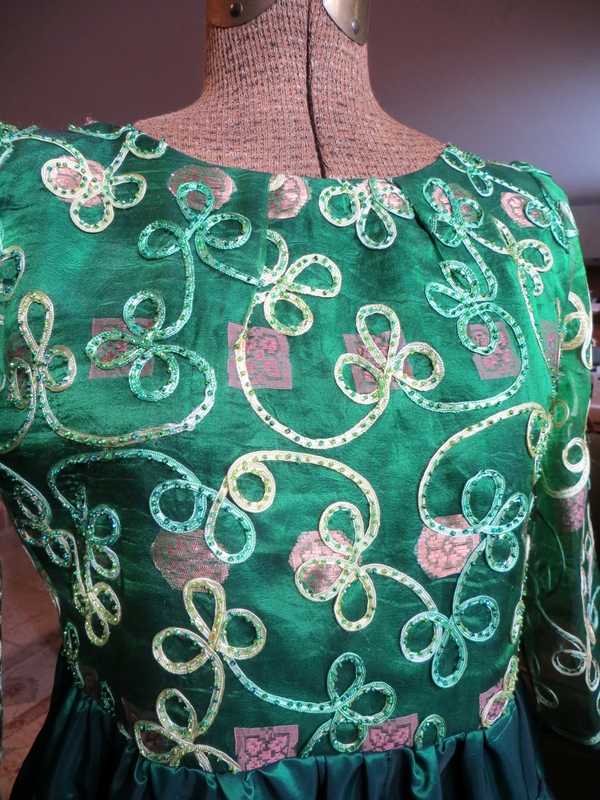 I also thought I’d bead the bodice after constructing the dress, of course. It was rather an afterthought, and now that its done, I’m not crazy about it. I wanted it to have that little something extra, but the beads don’t really show up that well, at least in the photos. 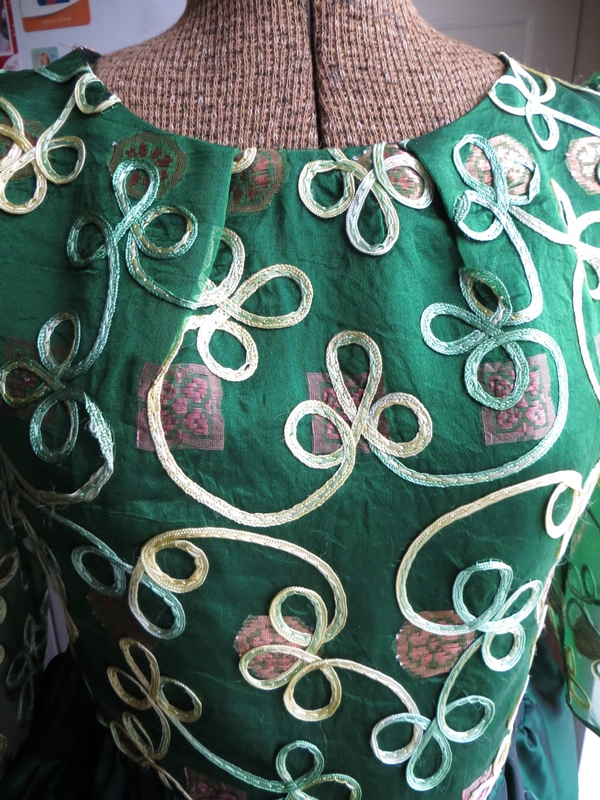 The fabric is very “alive” in real life, and I obviously don’t have the photography skills to capture it to show you. It’s a pretty dress, and DD2 is happy to wear it, which is win-win. You know I like the beading. In the light they will sparkle and glint very prettily. It’s a lovely touch I think. Wow, your girls are going to be so well dressed for Christmas! The taffeta is beautiful, I love that colour. That is lovely. The layered skirt is perfiect! What a lot of work has gone into this dress – truly special. That’s a lovely dress! 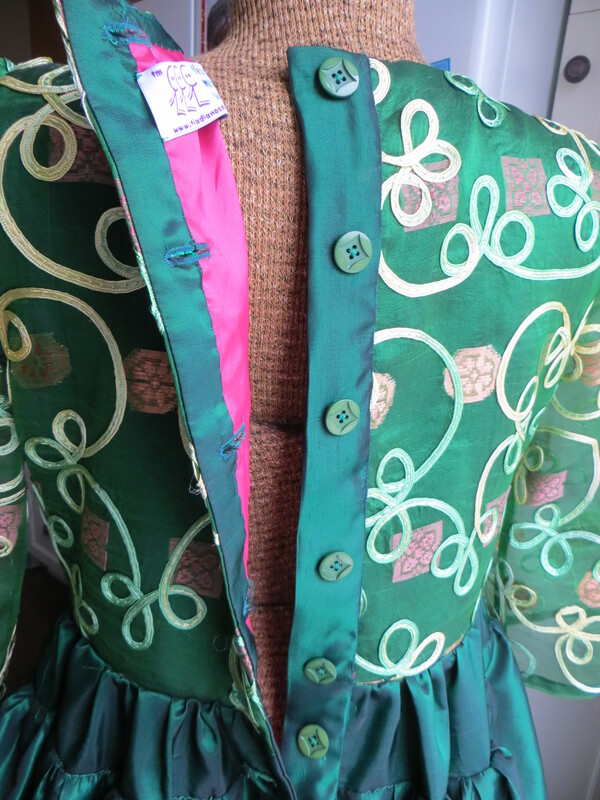 Love the fabric and cute buttons at the back.. Beautiful colour – so christmassy! So pretty! What a great colour and all the details! She must be very proud of you. Such a great mum you are!!! How beautiful. I wish you were closer and I could commission you to make my party frocks.